The Daredevil slot game is a great addition to the great range of Marvel Slots made especially for Playtech casinos, based on the original superheroes that featured in Marvel Comics from the 1960's onwards. Daredevil himself is a fearsome superhero, and although he is unable to see, his other senses are vastly superior to other humans, due to contact with a radioactive substance in his earlier life. 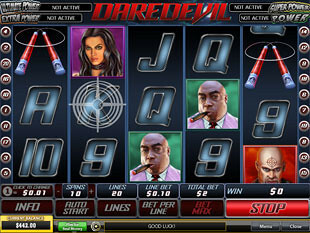 There are two main features in the Daredevil slot game to look out for. The first one is activated by the player before each spin, the Bullseye Feature � a truly unique addition to the slot game, and one we believe will be copied elsewhere as it's such a great idea. Also watch out for the Free Spins round which jumps into life with help from Daredevil's special radar senses, turning the slot game into a scanning machine with Random Wilds popping up everywhere, making for great payouts! The Free Games feature is activated by the DD symbol, the official Daredevil logo from Marvel. As a scatter symbol it can appear on any of the 5 reels to work, but you'll need to spin at least 3 of these symbols to activate the 10 Free Games bonus round with Random Wilds. This is truly one of the most spectacular Free Game features ever, as after every free spin the whole game is scanned from top to bottom by the special Radar powers of Daredevil himself, and will reveal the Random Wild symbols to give you even bigger wins.